How to access Google Stadia cloud gaming service. Home » Gaming » Tech News » How to access Google Stadia cloud gaming service. It is not like that Google is launching a gaming console for playing games. The company is launching a service named Stadia for playing games by using quality internet. It is just like that you are playing a game online on a server and stream the video feed to any device you want. You don’t have to buy any new hardware or controller to access Stadia but Stadia may not be available for all devices from starting days. Your game will quickly discoverable by 2 billion people on a Chrome browser, Chromebook, Chromecast, Pixel device. Google CEO Sundar Pichai said that they are planning to add more browsers and platforms over time. It is observed that the Chrome browser will be the primary interface to access the service on a laptop and desktop. Google says that you can play games with your existing controller like PlayStation4, Xbox One or Nintendo Switch controller and all work fine or if you wish you can buy the controller which Google is going to launch for it. If you are going to use Chromecast with your TV then you will be able to turn it into a Stadia machine but only the latest Chromecast support Bluetooth, so we should check whether you'll require an ongoing model to play with your current controller. The Google controller uses Wi-Fi and can easily work with older Chromecast models. 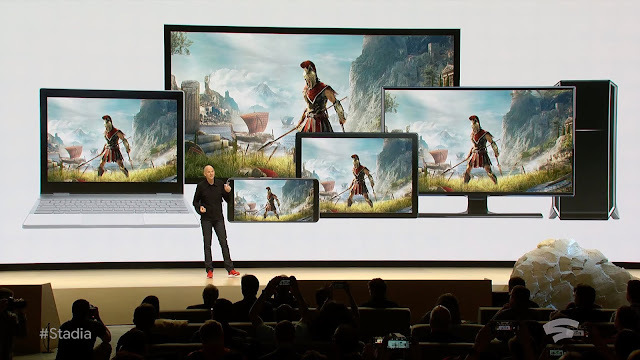 In the starting days of Stadia, it will only available on Pixel phones and tablets but soon it will roll out on all Android devices because there is no reason Google is not going to launch it for Android devices. One important point to note in all this is that Google didn’t mention Apple devices in the entire event but as we all know that Apple never allow third-party developers to sell digital content without going through their App Store and it will create a challenge for Google.